The most illustrious universities in the world have been the same for decades. Centuries even. Oxford has been around for 900 years, Cambridge for 700; and some say the prestigious Ivy League is so-called because it refers to the old, leaf-covered institutions of the United States. The league counts among its members seven of the nine colleges chartered before the American Revolution. What chance, then, do other universities have of crashing this illustrious party? Is there a new elite emerging, and can it ever challenge the might of the traditional big-hitters? Times Higher Education has identified a group of 53 “international powerhouses” – institutions that have the best chance of catching up with (and even overtaking) the world’s best universities. This cluster includes universities from 11 countries across North America, Europe and Asia-Pacific. It includes Imperial College London, the University of Toronto and the National University of Singapore, but it is noticeable that more than half of the places are taken by US institutions. Here’s how data scientist Billy Wong came up with the list: “We mapped the citation and reputation scores of the 980 universities that appeared in the latest THE World University Rankings across eight subject areas. It revealed that while a group of “old stars” such as Oxbridge, Harvard and Princeton have very strong reputations and tend to perform strongly across all disciplines (particularly the arts), a new cluster of universities – often slightly younger, and often performing well in scientific disciplines – was emerging. These are what the THE calls powerhouse institutions, universities whose research output is exceptional, but in many cases hasn’t been reflected in their reputation scores. Make no mistake: these universities are good at what they do, and if they continue to perform well, their reputations will grow and grow. 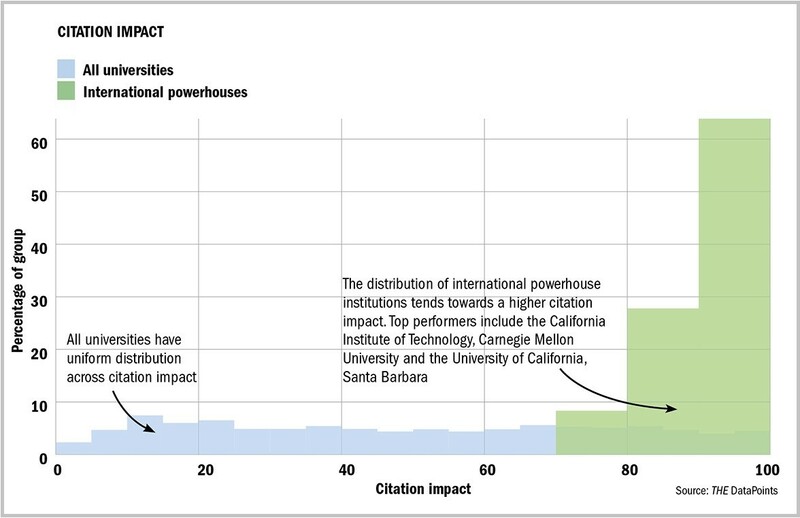 Here’s how the 53 powerhouses perform when you look at their citation impact, which draws on the number of times a university’s published work is cited by scholars globally. It’s a good way to judge the universities’ role in spreading new knowledge and ideas. As you can see, the powerhouses generally exhibit a higher citation impact score than you would expect from world ranked institutions. Their work is being noticed. When THE’s Ellie Bothwell interviewed some of the leaders of the international powerhouse universities, several suggested that their strong medicine faculties and highly interdisciplinary research had led to their high scores in both clinical subjects and research citations. Michael Spence, vice-chancellor of the University of Sydney, said his university had invested heavily in large-scale multidisciplinary research since 2010, which has attracted “very strong and highly cited researchers” to the institution. Stephen K. Hashmi, vice-president of Heidelberg University, said that around a sixth of the students at his university were at PhD level, pointing to high levels of basic research. Caroline Whitacre, senior vice-president for research at the University of Ohio, attributed the institution’s success in citations to the establishment of “gateways” in China, India and Brazil, which has resulted in international research projects; and a 10-year university programme aimed at hiring 350 new academics to solve “global problems”. These universities mean business. They are innovative, have a huge amount of research nous, and have been incredibly successful in building strong academic networks. But enough about how they did it. Here, in full, is the list of universities we think could, over time, become the new elite.